Q: Is this film accurate to the comics? Q: Whats the gun that Constantine uses? The anti-hero in us all. Constantine was the Roman emperor who recognized Christianity and made if possible for the Church to move from the underground into the public arena. He did it out of convenience, thinking that it would be easier to work with the Christian church than try to fight it. He lived most of his life as a ruthless leader who gave the orders to kill even members of his family. Constantine accomplished much good in his life, even though he had what most would say were impure motives. But the Roman Constantine is not the same as the same-named title character of the new film, "Constantine," from DC-Vertigo Comics and Warner Brothers Pictures. Or is he? John Constantine, from the comic novels "Hellblazer," is doomed to hell when he dies. His situation may be hopeless, but he operates as if he could buy his way into heaven by doing enough good by removing enough evil from the world. He's a chain-smoking, hard-drinking, rude and uncaring man who is the hero of our film. Angela Dodson is a pure-hearted, loving sister who is seeking the truth to her twin sister, Isabel's, death. It would seem she has nothing but the best motives, but conflicted people and incongruous motives are what make this movie interesting. Interesting questions surrounding the death of Jesus Christ, the existence of demons on Earth, the ultimate destination of our soul when we die and even the perfect lack of all evil in angels are woven into a screen adaptation of a character and story with a cult following. It seems as though this ambiguity regarding good and evil may exist in film as well as real life. 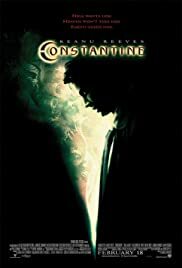 In "Constantine," it is not good verses evil -- but rather it is good and evil taking turns messing things up and making them better. In life the rule seems to be strangely similar. John Constantine's ability to do good without pure motives may give hope to the rest of us who regularly do things for all the wrong reasons. The visuals and the sound presentation in this film are wonderful. Philippe Rousselot's cinematography and Brian Tyler and Klaus Badelt's energetic soundtrack are masterful. The acting, however, is only adequate. Keanu Reaves has long since learned how to play Keanu Reaves. He continues with what he knows best. Shia LaBeouf, after a similar role in "I, Robot," is becoming quite an accomplished "plucky sidekick" too. But the standout in this film is the emotional and endearing performance by Rachel Weisz as Angela Dodson. The movie is one worth seeing aside from her presence, but Weisz's performance take it from a "see it if you like action movies" recommendation to a "see it to admire Rachel Weisz's performance" endorsement. Constantine is rated "R" for demonic images and violence. It opens in theatres February 18. 250 of 468 people found this review helpful. Was this review helpful to you?